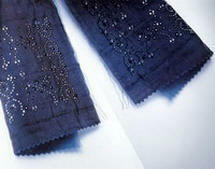 Crystals are used on fine clothing and fashion accessories. As far as the Apparel Search Company is concerned, it is best to buy your crystals from a world leader. Therefore, we suggest you take a good look at Swarovski the next time you are in the market for crystal for your fashionable creations. Pioneers were always way ahead of their time. In their minds they conceived the inconceivable. In their fantasies they created the impossible. When he invented an automatic cutting machine at the end of the 19th Century, Daniel Swarovski opened the door to a world of fantasy. 2007: Swarovski's exquisite crystals are used by designers in every corner of the design world. Discerning customers have made them to objects of desire in their own right. Now, due to the awareness of the excellence of Swarovski crystals and an ever-growing demand by a sophisticated clientele, the company has built a new product brand around its world famous crystals. 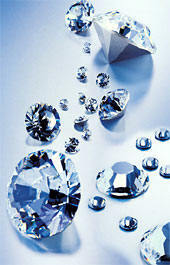 CRYSTALLIZED™ - Swarovski Elements is the new brand for the innovative and inspirational elements. Their huge variety of shapes, sizes, forms, colours, textures and finishes bring radiance and emotion to every object and accessory they adorn. 2006: Crystal enthusiasts will have more and more opportunities to shop at Swarovski Retail Stores. In 2006, 108 additional stores were opened in countries all around the world. Swarovski, the world's most exclusive brand of crystal jewellery and figurines, is now represented by 673 own-operated boutiques with an additional 516 partner-operated boutiques. 2005: A co-operation between Swarovski and Kludi, makers of fine bathroom fittings, has created a new dimension in bathroom luxury. The concept reveals a poetic symbiosis of the elements light, water and crystal. “Dazzling Daydream” is an intimate space where gently flowing shapes and noble materials merge to create a place of transformation. 2004: In 2004, 94 new Swarovski Stores were opened up all over the world. A new virtual museum is launched. The website www.thecrystalweb.org is a combination of museum, playground and information and is based on a new navigation system called Liquid. Swarovski developes the XILION cut, changing the arrangement of facets to enhance the refraction of light for even more sparkle. 2003 Crystal is inspirational power for art and science, the thinker's framework for ideas, multi-faceted symbol and aesthetic work of wonder. On the occasion of the 100-year anniversary of Swarovski in 1995, the Crystal Worlds were created as a memorial to the intangible and enchanting. Now they are entering a metamorphosis which acknowledges their past success as an exhibition centre, concert and festival hall. Expanded around breathtaking chambers of wonder and with a strong focus on contemporary fine art, the broad shouldered Giant from Wattens shall display a new access concept and a shop that is separate from the exhibition area. Artistic director, André Heller (Artevent), is responsible for realising this € 15 million reconstruction. 2001 Trend advice, inspiration and product information is guaranteed by a global network of Swarovski Creative Service Centers. Following Wattens (1995), Paris (1999), New York (1999), London (2000) and Milan (2000), centers were opened in Sao Paolo (2001) and Dubai (2001). 1977 It started with a crystal and moved on to some of the most beautiful ring, earring, bracelet and necklace creations. In 1977, Swarovski launched its first jewellery line – the Swarovski's Jeweler's Collection. The collections are attuned to the mood of the moment, and confer a touch of poetry.Today Swarovski jewellery fulfils the most demanding quality criteria and design expectations. 1976 A crystal mouse begins a new era for Swarovski: the retailing of finished crystal products. The original mouse is the first object in the "Silver Crystal“ range, which now incorporates more than 120 gift articles and collectibles. The brilliantly cut animal figurines, fruits and other decorative objects are available worldwide in over 7'500 specialist retail outlets. In 1976 a little crystal mouse formed the beginning of a new product strategy. For the first time, crystal became fascinating not only as a component of Haute Couture and chandeliers, but also as a finished crystal object. A multi-faceted series of sparkling treasures grew from the little crystal mouse, which became a bestseller at the winter Olympic Games in Innsbruck. Inspired by nature and beautiful objects, the charming figurines spread a feeling of joy and well being amongst collectors and enthusiasts all around the world. 1975 In 1975, after years of research and technological efforts, Swarovski presented its Hot-Fix technology, which made it possible to add sparkling radiance to any item of clothing. With the assistance of a newly -developed molten glue, finished crystal motifs could now be applied to the most diverse materials with the use of heat and pressure. Thus jeans, T-shirts, bathing costumes and hosiery gained seductive radiance. 1892 The play of light in crystal must have fascinated Daniel Swarovski from early childhood. He was born in 1862 in Bohemia where crystal defined life in his parents' house. Bohemia, at that time part of the Austro-Hungarian Empire, was one of the most important manufacturing centres for glass and crystal. Crystal was also cut in his father's small factory. As a young boy Daniel often watched the work in his father's business. Later he completed his apprenticeship with his father, as well as at several other crystal-cutters. When, at the age of 21, he visited the "1. Elektrische Ausstellung" (First Electrical Exhibition) in Vienna, he had the idea of his life: the new techniques from Siemens and Edison inspired him to develop a machine for cutting crystal. He worked day and night at realising his vision. Finally, nine years later (1892), he was ready to register a patent: a machine which, for the first time, made it possible to cut crystal to perfection. It was far faster and more precise than the manual work to date. Thus began a new era in the world of crystal. The foundations had been laid for today's company. Daniel Swarovski together with his brother-in-law Franz Weis and with Armand Kosmann founded it in 1895.